A warped path from Caspar David Friedrich to Adolf Hitler arrives at the dark heart of German Romanticism. Does a painting represent human triumph or a humbling? The answer is in the ideological eye of the beholder. 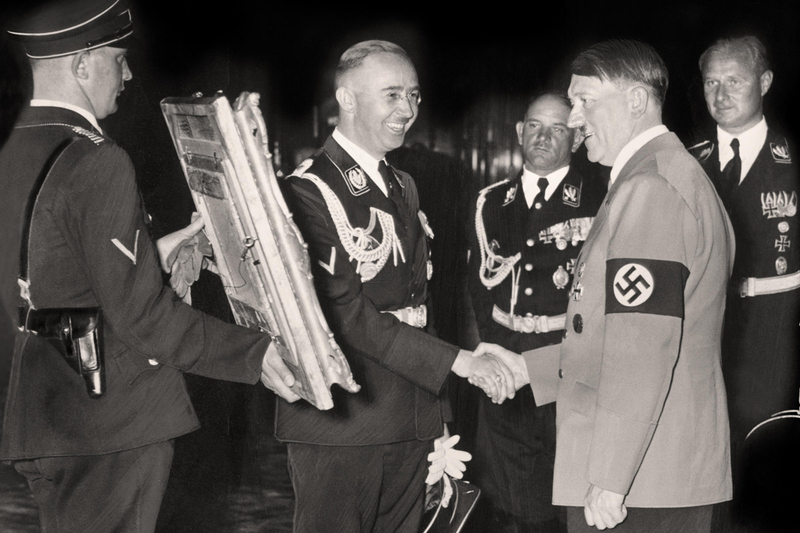 Adolf Hitler presented with a painting by Heinrich Himmler, 1939. 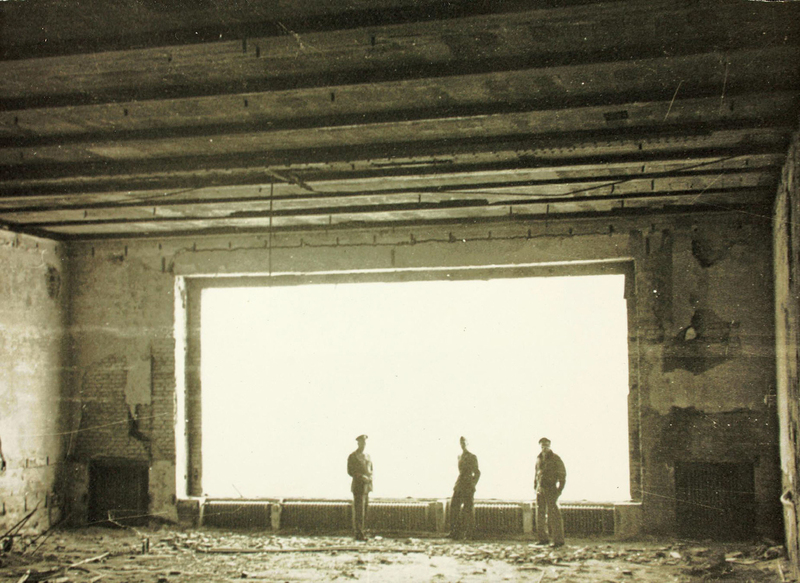 By the time US soldiers arrived at the Berghof in May 1945, Hitler’s alpine retreat had already been gutted. Allied bombing had obliterated much of the site, before SS guards ignited what was left. Earlier photographs of the Great Hall show an uneasy mix of the rustic and opulent. There were busts of the composer Richard Wagner and Hitler’s mentor, the morphine-addicted playwright Dietrich Eckart. Given that Hitler spent much of the war here, there was a globe, a marble table for meetings and a Gobelin tapestry that concealed a cinema screen. Paintings adorning the walls were traditional from Italian Renaissance to German Romanticism, including, at one stage it is said, Böcklin’s foreboding Isle of the Dead. A huge picture window in the living room, famous for its size and the fact that it could be lowered, was Hitler’s pride. It offered a view of the Untersberg, Berchtesgaden, and Salzburg. However, Hitler had been inspired to situate his garage underneath this window; when the wind was unfavourable, a strong smell of gasoline penetrated into the living room. All in all, this was a ground plan that would have been graded D by any professor at an institute of technology. On the other hand, these very clumsinesses [sic] gave the Berghof a strongly personal note. The place was still geared to the simple activities of a former weekend cottage, merely expanded to vast proportions. Hitler was fond of the nearby Mooslahnerkopf tea house and enjoyed regular walks to it, with the spectacular views of the mountains and forests on the route and at the adjacent overlook. He was much less keen on the Kehlsteinhaus, the so-called ‘Eagle’s Nest’ located on a high mountain peak. An expensive birthday gift dreamt up by the sycophantic Martin Bormann, head of the Nazi Party Chancellery, Hitler feared hypoxia at high altitude, the dangerous curves in the road and the claustrophobic elevator trip through the mountain to reach it. He worried, too, about the possibility of lightning strikes. It was, however, at the Berghof, which he’d bought and developed with proceeds from Mein Kampf, that he spent most time. Before the vast window, he would lay out his maps and stare at the Untersberg, inside which, competing legends have it, the medieval conquerors Charlemagne and Barbarossa lie in slumber (the latter providing the code name for Hitler’s catastrophic invasion of the Soviet Union). When the victorious Americans took their photographs, framed in the vast viewing space, the mountain shone dazzling light onto a burnt-out husk. It was a scene of both hubris and nemesis that charted back to a single painting. Few paintings have had the depth and breadth of influence of Caspar David Friedrich’s Wanderer Above the Sea of Fog (1818). One way of discerning its lasting impact is to look at the subjects of books that regularly use the image; Romanticism, psychology, the Sublime, the Enlightenment, philosophy and self-help. It is accepted as a depiction of the awe-inspiring immensity of nature and mankind’s conquering of it, through boundless heroism and imagination. While Friedrich’s other paintings are considered darker – ruined gothic churches, a monk lost by a cataclysmic shore, a shipwreck consumed by a sea of ice – Wanderer remains triumphant. And yet, the painting has darker tones, of being solitary, lost or prone to over-confidence as the elements close in. We do not see the expression on the face of the isolated character. We do not know what the wanderer is contemplating, but we might infer from Friedrich’s life, haunted by witnessing his brother’s death from drowning while trying to save Caspar from a frozen lake, and prone to depressive reclusion, that it is not wholly transcendent. The legacy of the painting is ambiguous and troubled. With such an approach, the results could be dangerously unpredictable. One unlikely descendant of Friedrich’s wanderer was Edvard Munch (it is notable that the two writers who saved Friedrich from obscurity, Andreas Aubert and Julius Meier-Graefe, were also influential advocates of Munch’s work). The Scream (1893) might seem to be Wanderer’s opposite – claustrophobic where the Wanderer was liberating – but their commonality is emphasised by the original German title Der Schrei der Natur (The Scream of Nature). Munch’s work reflected a forlorn, death-haunted upbringing in a family prone to madness and tuberculosis. Paintings of deathbed scenes, leering faces on twilight streets and melancholic nocturnes were the result of a threatening exterior world and a stricken interior one. They looked how it felt and it felt how they looked. It was his ‘soul’s diary’ and as such was much closer to Friedrich’s spirit than that of the Third Reich authorities, who would later officially claim the German and condemn Munch. Munch situated The Scream at Ekeberg, next to railings overlooking what is now Oslo. It was a setting he also used for a number of other works he produced at the time with similar maelstroms of fiery colour, on the topics of despair and anxiety. 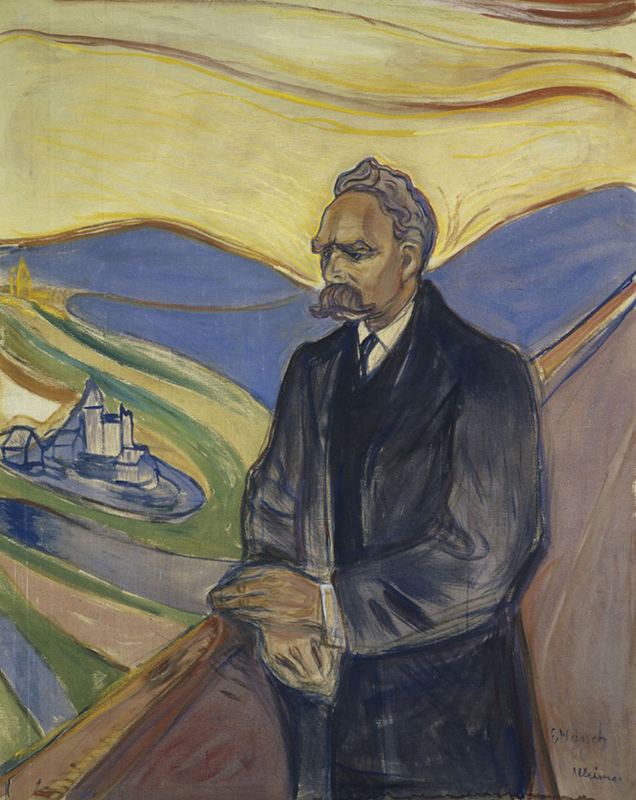 A decade later, Munch painted another figure in a similar view, with a sky glowing but not yet burning behind him – the philosopher Friedrich Nietzsche. Thus Spake Zarathustra, Nietzsche’s self-declared masterpiece, began in the Wanderer lineage, with the 30-year-old protagonist hiking into the wilds for a decade. Its prophetic exhortations emerge from a figure who has gazed far and wide, not from the stifling cloisters of academia or a stylite pillar in the desert, but from a mountaintop. Nietzsche conceived many of these ideas while on alpine walks, during summers spent at Sils Maria, Switzerland. 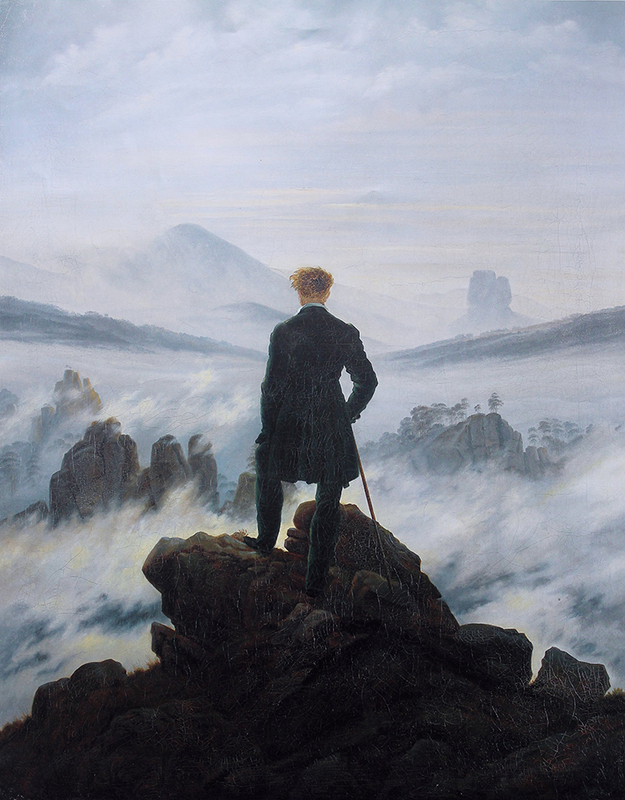 Nietzsche’s ideas of the Übermensch (‘superman’) and the Will to Power (striving to reach the highest possible position) seem to echo Wanderer Above the Sea of Fog, suggesting that through self-conquering effort, mankind could transcend itself. In his earlier book, Human, All Too Human, there was even a section named ‘The Wanderer and His Shadow’ in which Nietzsche championed ‘all those free spirits who are at home on the mountain, in the forest, and in loneliness’. While associates at the time saw the mountains in terms of mythological excess (Richard Wagner) or aristocratic folly (‘mad’ King Ludwig II), Nietzsche’s view was that of an expansive hermitage, one that has appealed to many supposedly visionary loners ever since. Man will make it his purpose to master his own feelings, to raise his instincts to the heights of consciousness, to make them transparent … The average human type will rise to the heights of an Aristotle, a Goethe, or a Marx. And above this ridge new peaks will rise. 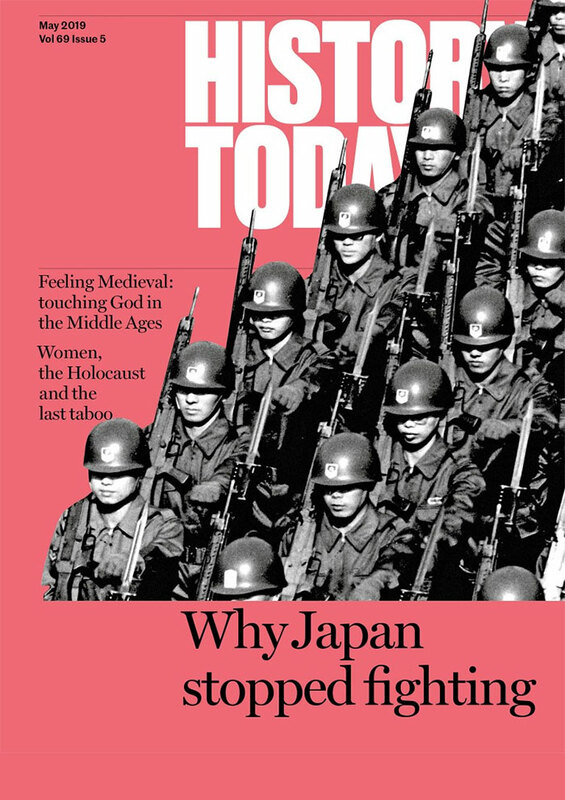 And, it found an audience on the nationalist right, where it inspired Hitler and the SS, who saw themselves, or at least their ideal, in Nietzsche’s merciless ‘blond beasts’. Were the political interpretations that led to the Soviet Stakhanovite workloads (whereby figures such as the miner Alexei Stakhanov were celebrated as heroes for their supposedly-superhuman productivity) and the Nazi concentration camps for ‘subhumans’ both grotesque corruptions of Nietzsche’s cloud-dwelling emancipatory ideas? The philosopher admitted that as a transgressive thinker he might be a calamity as well as a blessing for mankind and fretted about what followers might do in his name. He was right to worry. He would, no doubt, have been appalled (being an opponent of antisemitism and the ‘mendacious race swindle’), but his visions were pliable enough to be corrupted. After the philosopher’s death, Hitler heaped praise and attention on his antisemitic sister Elisabeth Förster-Nietzsche. She reciprocated by endorsing the dictator, gifting him her brother’s walking stick that he’d used while hiking in the Alps. Hitler would be pictured with it frequently at the Berghof. When on that fateful 6th of June in 1931, the old Glaspalast [in Munich] burnt down in that horrible fire, an immortal treasure of such true German art went up in flames. They were called the Romantics, but, in essence, they were the most glorious representatives of those noble Germans in search of true intrinsic virtue of our people. Among the lost paintings were those by Caspar David Friedrich, including Winter Landscape with Church (1808). Hitler had seen himself in that visionary providential tradition, from his days as a struggling painter of lacklustre watercolours in Vienna to his self-mythologising moment of blind revelation in a hospital ward when, supposedly like the Wanderer, he realised his destiny. Hitler’s painting Maritime Nocturno (1913) bears a distinct Caspar David Friedrich influence, though it is lifeless in comparison (nevertheless it sold at auction for €32,000 in 2012). Nazi-sanctioned artists often toyed ineptly with Friedrich’s style and viewpoints: the seaside nudes of Wilhelm Hempfing, Karl Truppe’s depiction of the Matterhorn, Franz Gebhardt-Westerbuchberg’s ominous On Guard for Europe (1942). The centenary of Friedrich’s death was celebrated extensively in Dresden in 1940, while the artist was recognised in the official Hitler-approved Art in the German Reich magazine. Friedrich’s subversive contemplative paintings were simplified by a regime that demanded and glorified unquestioning statuesque obedience. The warnings of hubris in his Gothic ruins were ignored. The Wanderer was no longer a character who ruminates on man’s place in nature but a theatrical oratorical figure who looks out and sees limitless living space to be conquered and ranks of soldiers to do so, as the Wanderer-esque photographs of Hitler at rallies in Dortmund and the Zeppelinfeld, Nuremberg, show. 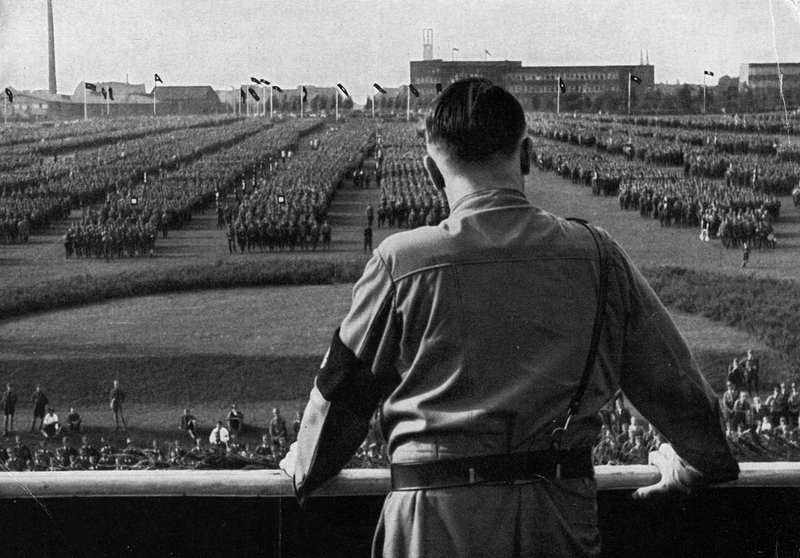 Adolf Hitler at a Nazi party rally in Dortmund, 1933. Meanwhile the true heirs of Friedrich’s subjective perspectives and Nietzsche’s quests had their work burned, were condemned in the Degenerate Art Exhibition of 1937 (‘If the age of Pericles seems embodied in the Parthenon, the Bolshevistic present is embodied in a cubist monstrosity’, Hitler claimed in Mein Kampf), went into internal or external exile or were murdered in the concentration camps. While Caspar David Friedrich cannot be blamed for the fondness in which the Nazis held his work, there was a distinct strain of darkness to the distorted German Romantic lineage. In the last film he made before leaving Germany in 1926, F.W. Murnau depicted the title character Faust prophetically burning books (as the Nazis later would) before staggering out onto a moonlit unmistakably Friedrich-esque scene, where he invoked the demon Mephisto. Later, in exile during the war, the German writer Thomas Mann would relate the Faustian pact with the Devil to both Nietzsche and Hitler in his novel Doctor Faustus. Living in Nazi Germany in 1937, Samuel Beckett saw Friedrich’s bleak but luminous Two Men Contemplating the Moon, a painting the playwright would admit directly inspired Waiting for Godot after the war. It was a conflict he’d barely survived, hunted down in nightmarish conditions by the Nazis as a member of the French Resistance, but eventually escaping. Hitler’s dreams meanwhile were built, supposedly, of mountainous stone and cavernous marble. He envisaged Linz as the art capital of the world, surpassing Paris and Rome, and Berlin transformed into Germania with a dome so large that clouds would form inside it. He cultivated a Hitler Youth that took the Bohemian hiking adventures of the Wandervogel youth movement and moulded it into one obsessed with fitness, order and racial purity. It is of little surprise that the Nazis feted mountain-climbers as supreme figures in their pantheon. Two of the figures of the doomed party that died on the Eiger’s Mordwand or ‘Murder Wall’ in 1936, as recounted in Heinrich Harrer’s haunting The White Spider, were members of the Wehrmacht. The author himself was both an acclaimed mountaineer and a member of the SS. but otherwise it seemed to us completely unimportant. I often saw Hitler furious but seldom did his anger erupt from him as it did when this report came in. For hours he raged as if his entire plan of campaign had been ruined by this bit of sport. Days later he went on railing to all and sundry about ‘these crazy mountain climbers’ who ‘belong before a court-martial’. The mythology of the all-conquering hero had been shown to be little more than a cheap symbolic stunt at a time when the German 6th Army was being starved and slowly obliterated in the rubble of Stalingrad. All of the wild-eyed self-belief began to crumble away as it became clear that the war was lost and desperation slowly began to take hold. In mid-July 1944, Hitler would leave the Berghof for the last time for a succession of bunkers, as the Thousand Year Reich collapsed. The following Spring, German soldiers would look out from the Seelow Heights, the last obstacle before Berlin, waiting for the advancing Red Army. The mythic Alpine Redoubt where they would make their last stand, like the Wanderer, remained a myth. Instead, the vast expanse of the Berghof’s picture window, revealing as Caspar David Friedrich knew all too well, the void as well as the sublime, narrowed and narrowed until it was nothing but the walls of a subterranean tomb. 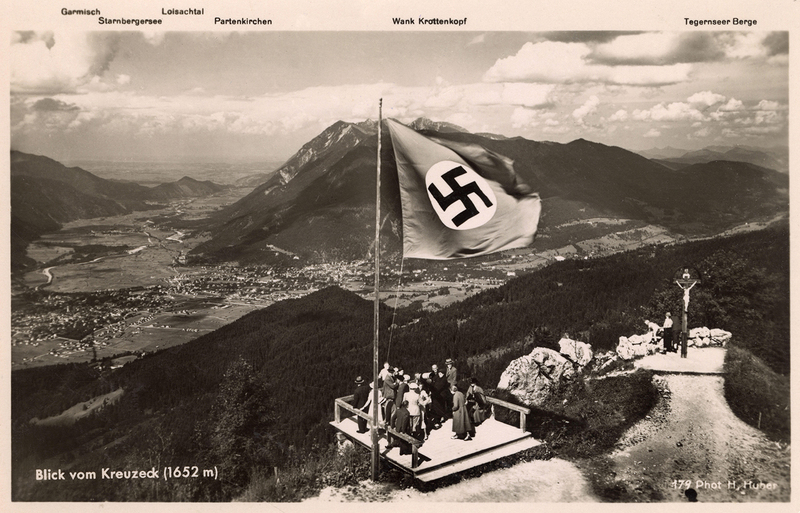 View from the Wetterstein mountain range in Bavaria, mid 1930s. Hitler’s bohemian pretensions lasted until the end. So too did his monomania. In October 1939, Life magazine quoted the dictator, in conversation with the British diplomat Sir Nevile Henderson: ‘I am an artist and not a politician. Once the Polish question is settled, I want to end my life as an artist.’ The ‘Polish question’ would lead, of course, to world war and the downfall of the Third Reich. Increasingly, Hitler took refuge in delusions of grandeur and protection by divine providence. One of the few generals to confront the Führer, Franz Halder, noted in his diary that ‘Hitler’s decisions … were the products of a violent nature following its momentary impulses, which recognized no limits to possibility and which made its wish-dreams the father of its acts’ (as quoted in William L. Shirer’s The Rise and Fall of the Third Reich). He became even more of a fantasist, either in flights of fancy or rambling frenzies, and all the while the brutal facts of the deteriorating situation for Germany remained. All the claims of transcending human and moral bounds had turned Europe into a charnel-house. A single-minded view of Wanderer Above the Sea of Fog is to see the painting as a testament to the conquering figure at its centre. It is unsurprising that the fanatical tyrant Hitler had such a one-dimensional view of art, declaring at the time of the Degenerate Art exhibition that ‘works of art which cannot be understood in themselves but need some pretentious instruction book to justify their existence will never again find their way to the German people’. Yet Wanderer Above the Sea of Fog demonstrates that great art is innately subjective. The painting can be interpreted as the so-called ‘triumph of the will’, but also the humbling of the ego amid the vastness of nature and existence. It’s an ambiguous work, as much about contemplation, mystery, peace and (in)significance as supremacy. Its central figure remains not statuesque or titanic but forever wandering. Darran Anderson is the author of Imaginary Cities (Influx/University of Chicago Press, 2015).